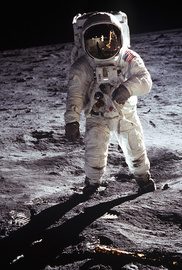 Experience what it was like for Neil Armstrong be the first person to step on the moon. On July 20, 1969 Neil Armstrong and Buzz Aldrin became the first men to walk on the moon. You can now experience this event by becoming Neil Armstrong and boarding the Saturn V Rocket which is still to this day the most powerful machine ever created by humans.